Tired of shows that merely entertain? Now you can lose weight, get rock hard abs and make money while you laugh. 100% Guaranteed*. Following on from sold out seasons with his previous two Melbourne International Comedy Festival shows In Denial and Successful Losing, Gavin Baskerville returns in 2004 with 100% Guaranteed*. 100% Guaranteed*. will stretch and tone those flabby laughing muscles WHILE YOU WATCH! If you have ever found yourself hypnotised by a late night infomercial, bamboozled by an investment expert, or seduced by a sleazy car salesman, then this show is for you. 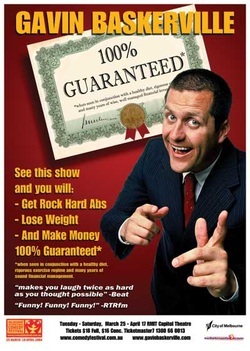 100% Guaranteed is an investigation into the ‘hard sell’ tricks and techniques that make us part with our hard earned money and more importantly, an insight into what that little asterisk and all that fine print really means. 100% Guaranteed is scientifically designed and endorsed by 9 out of 10 people who speak like they are reading from cue cards and is exclusive to the 2004 Melbourne International Comedy Festival for a strictly limited time. See this show and you will also have the opportunity to watch one of Melbourne’s best up and coming comics strutting his stuff. With five years stand-up experience and a Raw Comedy national final under his belt Gavin will demonstrate a wit and comic edge that is so sharp it can cut through a tin can and still effortlessly slice a tomato. 100% Guaranteed* is 100% Guaranteed** to be a successful and hilarious show and is 100% guaranteed to be 100% Gavin Baskerville. No questions asked! *when seen in conjunction with an ongoing rigorous exercise regime, a healthy diet and sound financial investment and management over a sustained period of time. Let's face it, we all want to see infomercials get a good pasting. We'd tolerate pretty much any quality of show as long as it sunk the boot Directly up Danoz. Enter Gavin Baskerville -coincidentally at 11.00pm, a time that means infomercials are competing with him for audience members. As it turns out, the quality of this show is pretty reasonable. Not that many people would know, as the good Melbourne folk seem to turn into pumpkins somewhere between Dan Kitson's 9:45 show and the 11:00 slot. BUT WAIT, there's more! That's right. Not only does Baskerville hoe into infomercials but he leaves some bile for banks, casinos and real estate agents as well, all in the characteristic laconic and likeable Baskerville manner. So how much would you expect to pay for this show? $300? $200? $50? I have no idea - we get comps. But whatever it is, it's worth it.